Nagaraj is often criticised and laughed at for his theatrics, but he’ll remain relevant till the question of Kannadiga pride remains relevant, say observers. Bengaluru: If there ever was an award for ‘master of protests’ in Karnataka, the obvious recipient would be Vatal Nagaraj. Of the scores of bandhs called in the state, those called under the banner of his Kannada Chalavali Vatal Paksha (KCVP) invariably turn out to be the most effective. 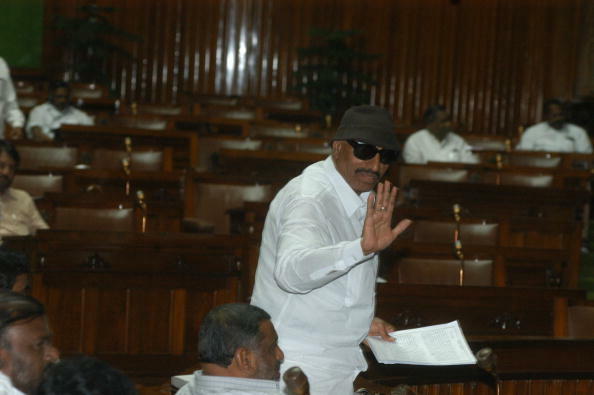 Theatrics are Nagaraj’s forte, be it on the floor of the legislative assembly or the street. He makes his point with much comic relief, including demonstrations using cattle, donkeys, household items and even commodes, invariably grabbing public attention. But do not mistake this for popularity; it is the fear of possible violence and the need for all pro-Kannada organisations to protest under one banner that make his bandhs effective. For decades now, the 68-year-old has claimed to be the representative of the pro-Kannada voice. He is the man who brings the city of Bengaluru to a standstill while calling for a bandh on issues such as the Cauvery water dispute, job reservation for Kannadigas, and screening of non-Kannada films. The latest one was on the Mahadayi water sharing dispute. Nagaraj, the former MLA from Chamarajnagar, has had a unique political career. “I can still become the CM. I almost became one, but it did not fructify,” he tells ThePrint on his way home after a day-long bandh called to demand the intervention of Prime Minister Narendra Modi to resolve the Mahadayi water sharing issue between Karnataka and Goa. In 2009, he decided to contest the Lok Sabha elections under the KCVP banner. Soon after, the Election Commission allotted him a ‘coconut’ as his election symbol. Nagaraj has always maintained that he does not have any party funds, so he decided to crowd-fund by selling coconuts on the streets of Bangalore, each one priced between Rs 5 and 10. “This was the most unique way I could think of to raise funds for my campaigning and also create awareness about my symbol,” Nagaraj says. Amused by his stunt, several voters offered up to Rs 500 per coconut. But this annoyed the EC, which immediately asked him to stop the “sale of his election symbol”. The EC served him a notice for violating the Model Code of Conduct. By that time, he had made a tidy sum of Rs 35,000 in two days of campaigning. Then decided that each time he met a voter who wanted to buy a coconut, he would break it into two, offer one half as “prasad” (blessing) and in the other half he would accept a contribution as “dakshina”. That way it would not violate the code of conduct, and let him still crowd-fund. Nagaraj has made himself the go-to-man for Kannada causes, but his mass appeal is restricted only to creative protests, not concrete solutions. So much so that he is often criticised as a publicity-hungry comic. His unique ways of protesting have always caught eyeballs – be it his attempt to urinate in front of Raj Bhavan because he wanted to highlight the lack of public bathrooms , or riding a bullock cart to Vidhan Soudha to protest against increased fuel prices. He has never missed an opportunity to showcase his Kannadiga pride. Kollywood actor Sathyaraj had to publicly apologise to the people of Karnataka for a comment made by him nine years ago on the Cauvery issue because Nagaraj said he would not allow the screening of the blockbuster movie Baahubali till the apology was rendered. Superstar Rajinikanth too was not spared; his film Kabali was released amidst tight security as Nagaraj and his followers burned effigies saying that undue importance was being given to a “non-Kannada” movie. But Captain G.R. Gopinath, the founder of Air Deccan, who contested the 2009 general election against Nagaraj from Bangalore South, is among those who are not fans of his style. “I am for all kinds of non-violent protests, but not bandhs. I support the cause Nagaraj stands for, but I do not agree with the way he does it. Any bandh called by Nagaraj, or Yeddyurappa, or any party, is in my opinion, anti-national. I say this because it affects the poor and hits productivity, and so, it is totally unnecessary,” he says. T.V. Mohandas Pai, chairman of the Manipal group of educational institutions and Aarin Capital and former CFO of Infosys agrees with Gopinath. But Nagaraj is undeterred. “We should always protest. You will see the effect of our bandhs one day. Don’t expect results as soon as a bandh is called,” he says. Many term Vatal Nagaraj and his supporters “fringe elements”, but there have been instances when he has set an example of being just and fair. The Karnataka assembly had moved a privilege motion against a local daily called Lankesh Patrike, run by P. Lankesh, father of slain activist-journalist Gauri Lankesh. For nearly a decade and a half, Lankesh had written against Nagaraj and his unconventional protests. During the discussion on the floor of the house, Nagaraj challenged the motion, saying it was a ‘move to curb the freedom of expression’, and ended up on the winning side. In 2009, when Hindu fringe groups threatened to attack couples on Valentine’s Day in Bengaluru, Nagaraj rode the streets of Bengaluru on a horse-driven chariot, saying he would play the role of Cupid and assure safety and protection to all lovers. “I stand for justice and I will fight till the end if I think something is wrong,” he says. Bhaskar Rao says one shouldn’t think of him as a spent force. “Nagaraj’s survival is based on the Kannada cause, and as long as that remains, he will remain. There are 2,700 Kannada organisations in the state today and he manages to bring them together for the Kannada cause. That is not an easy task. It’s not because he is their leader; it is because they all are fighting for one cause: Kannadiga pride,” Rao says.